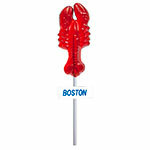 Boston Lobster Pop. 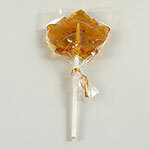 Strawberry flavored lollipops. Hand-poured, no preservatives. A taste of the past. Salt free and fat free. 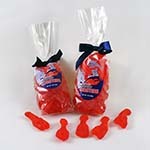 Our lobster pop measures 8 inches tall. The lobster's body is about 1 1/2 to 2 1/2 inches wide by 4 1/2 inches tall.